Two faith leaders in Birkenhead took part in an interfaith football match on Friday 16 November. The Revd Mike Loach and Ibrahim Syed, who have been friends for over two years, led out their sides in the first of what they hope will be a regular match involving local Christians and Muslims. Ibrahim, the leader of the Wirral Deen Centre - a new mosque in Birkenhead, said: "The idea was a simple one: why don’t we use the power of the Beautiful Game to strengthen friendships across faiths. It came out of our shared love of the game and of a belief that sport can connect people across many different boundaries." Ibrahim took the idea of an interfaith football match to Tranmere Rovers Football Club, with which he had already formed strong links due to his work in community outreach. TRFC was immediately supportive and have agreed to offer the use of their grounds. Ibrahim and Mike have a mutual desire to work together and to challenge perceptions by presenting a positive public image of Christians and Muslims working alongside one another. The Revd Mike, Vicar at Christ Church, Higher Bebington, said: "Our friendship has been particularly powerful following various terror attacks and has attracted a lot of positive attention locally. We wanted to challenge some of the negative headlines that emerged and instead, promote the message of love that stands at the heart of our beliefs. We've attended events at each other's place of worship and Ibrahim laid a wreath at Christ Church for Remembrance Day. Imams at the Deen Centre have also got involved and we have taken several school assemblies together. We are looking forward to strengthening our friendships through the medium of sport." The first match took place on Friday 16 November from 9-10pm in the Recreation Centre at Prenton Park and coincided with Inter Faith Week which ran from 11-18 November. 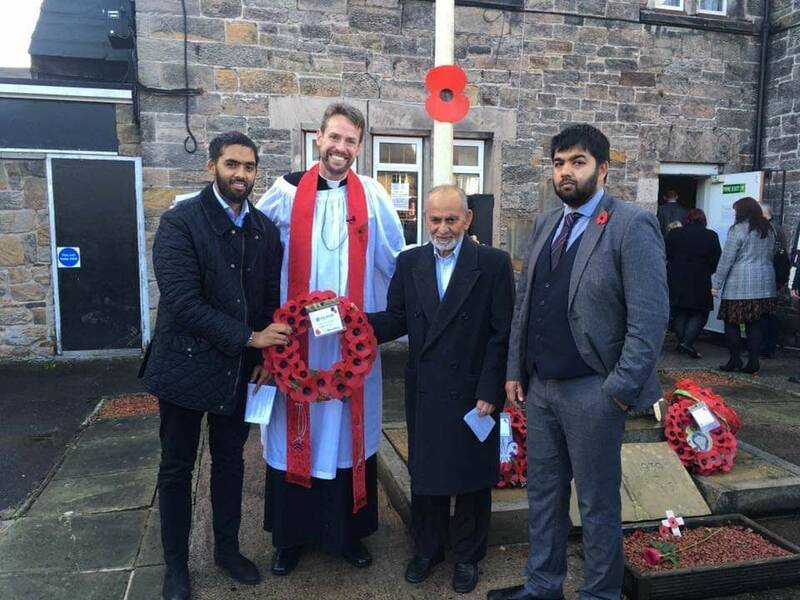 (LtoR) Ibrahim Syed, Revd Mike Loach, Dr Fayaz (an elder at the Mosque), and Dawood Syed laid a wreath at Christ Church for Remembrance Day. Speaking at a Sport in Ministry Day in October, the Archbishop of York, Dr John Sentamu said: “I think that sport offers the most wonderful way of opening doors of opportunity. Through sport, we discover more of all that God created us to be – whether as coaches, as players or as supporters – and that transformations are possible. With God on your side, everything is possible."